Photo taken near Side, Turkey at 6am. The last day of my holidays. Canon EOS 350D, Sigma 10-20mm f/4-5.6 EX DC HSM, 3-image HDR. Oh wow! I absolutely love this. It is fantastic. The colors and sharpness in the middle are amazing. I didn't like this one when I first looked at it, but the more I examine it I like it's neutral and very crisp quality. The umbrellas and the wood just look so sharp as well. 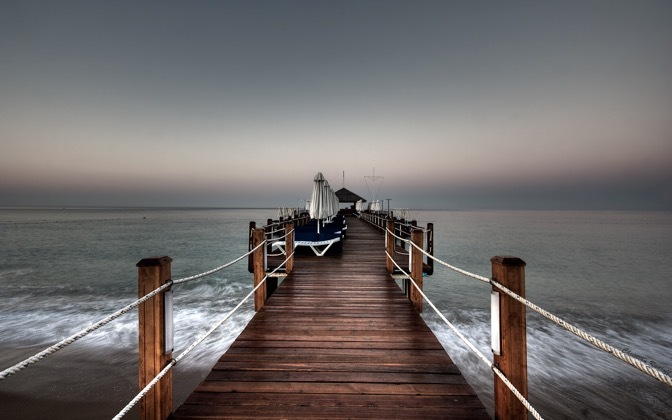 This picture leaves you wanting more and hoping that the sun will bring life to this pier later in the day. Not spectacular, but it's something different. This is Perfect Photography, About Where in Turkey ? Really nice looking textures, and the haze on the horizon looks great. If I have a complaint, it's just one. I don't like the signature text. I liked this at first viewing. This is one of the more interesting perspective shots.The key for me is the bifurcation of the pier by the umbrellas--what is conventionally totally symmetry is rendered asymmetrical, but still dutifully parading into the distance. The composition never resolves, but that is the beauty of it all. Nothing need be touched. Please give yourself a gold star and a first place certificate. Like they said above its a fantastic picture. Love the coloring of the dock with the contrast of the water. The only thing that needs to be done is that the horizon needs to be rotated ever so slightly.